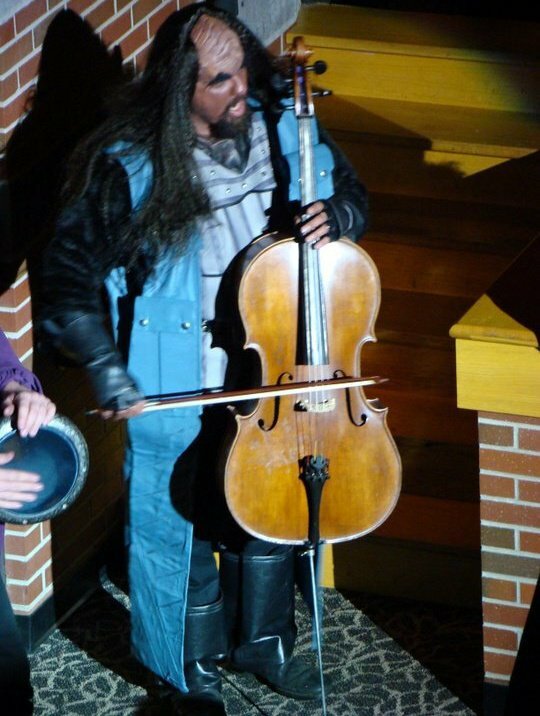 Jon Silpayamanant as a Klingon performing before a production of The Pirates of Penzance (in Outer Space) in New Albany, Indiana. So, as I mentioned in the previous post, there is an embarrassment of riches as far as performing options are concerned, if you’re willing to think outside the box. The past few years I’ve been playing the Sci-Fi/Fantasy circuit. I hesitate to call it the “Sci-Fi/Fantasy Convention circuit” if only because some of the best paying gigs I’ve gotten recently happen to be at organizations outside of the Convention circuit proper. And some of that has started to creep into the so-called ‘high arts’ realm with organizations such as Symphony Orchestras playing themed shows dedicated to particular Sci-Fi or Fantasy franchises (e.g. Lord of the Rings, Star Wars) as part of their pops seasons. On the whole, however, there’s always been music at conventions–even if it only consisted of filk music. Part of the Klingon schtick is as much act as play and the idea came to me as a whim after il Troubadore started playing Sci-Fi conventions at the request of some bellydancers. We decided we needed our own act and schtick, thus was born the il Troubadore Klingon Music Project. Ok, so I talk about the short series of events from bellydancer request to Sci-Fi convention to developing a full blown Klingon Band personae as if it’s an everyday thing. But seriously, for me, it is. That’s the specific issue at hand here. Over the years I’ve heard all manner of musicians grouse about the lousy economy and the lack of work. And here, I’m talking primarily about those musicians who do not hold full time or professional positions as musicians–this includes freelancers, but also just your normal everyday band musician. I know I’ve brought up this issue plenty of times in the past, but don’t want to flood this post with a ton of links.